Nothing says winter style like cozy knit sweaters, chunky knit scarves and pompom hats! Lucky for me, this look has it all! This look is perfect to layer under your winter coat and also looks cute just on its own! Hat: I picked mine up from a Kate Spade Outlet back in November, it was on sale for only $20! I wanted it so badly last year but couldn’t justify paying close to $80 for a hat. I was so happy to find it this year and for such a good deal! Click to see where it is currently available. Earrings: I’m such a fan of statement earrings, and these white pompom ones sure do make a huge statement. I call them my little snowball earrings. I picked them up on sale from H & M for $7 around Black Friday. H&M has a great selection of fun statement earrings for everyone’s style! Scarf: This pompom scarf instantly became my new favourite winter accessory! With so many colours in it, it goes with everything! The pom pom details are of course my absolute fave thing about it. I ordered it online from Old Navy on sale for approximately $12.00. It’s currently sold out online but you may have some luck in-store. Similar styles here for only $9.99! Sweater: This sweater is from Reitman’s Winter collection last year. I didn’t realize how much wear I would get out of it but I still can’t get enough. I got right before Christmas when it went on sale for 50% off and it made an appearance on the blog last year too! It’s super cozy and perfect if you want to layer a plaid shirt underneath or leave it on it’s own. 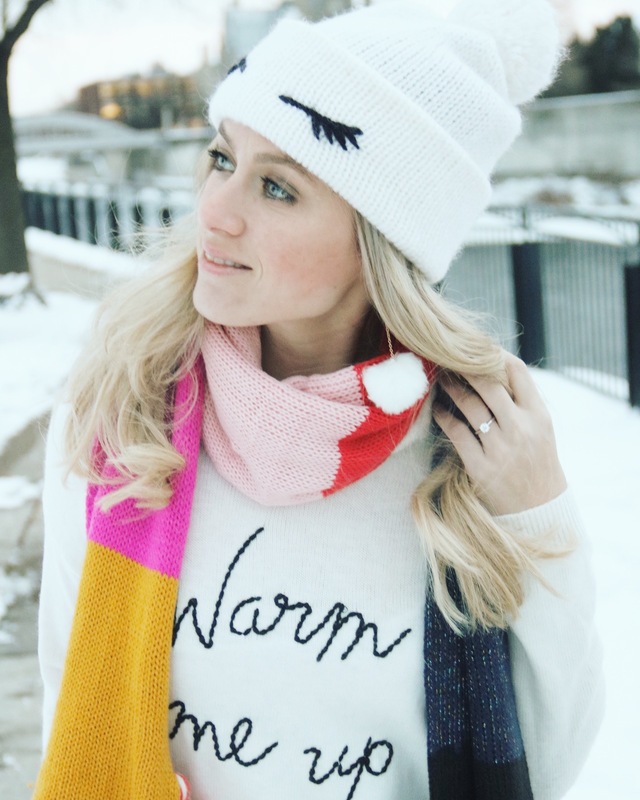 I love how perfectly it matched with the pom pom hat and the scarf this time around and the cute little saying is a fun touch! Hope everyone out there experiencing all the cold and snow is trying to stay warm!